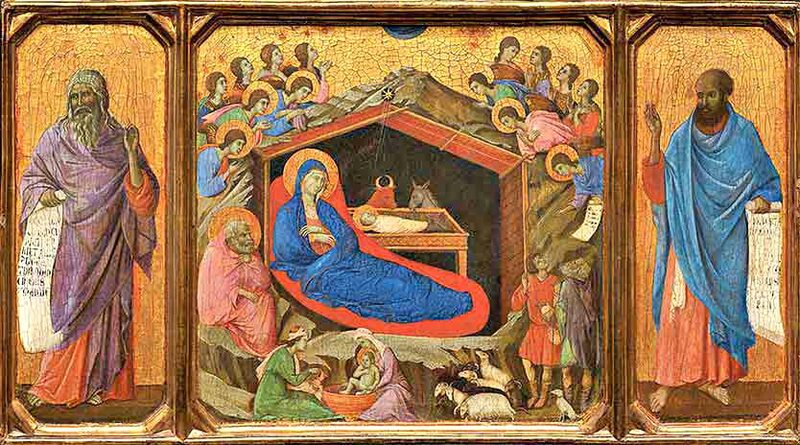 Nativity panel by Buoninsegna, Siena, Italy c. 1310. Isaiah is shown on the left, Ezekiel on the right. 275 people in our community are currently praying with you. "Blessed be the man who walks not in the counsel of the wicked. Alleluia. For the Lord knows the way of the righteous,but the way of the wicked will perish." To see them all and know that you are here. Into your hands, O Lord, I commend the souls of your servants departed from this life and beseech you to grant them rest in the place of your rest, where all the blessed repose, and where the light of your countenance shines forever. And I pray also to grant that my present life may be godly, sober, and blameless, that, I too may be made worthy to enter into your heavenly Kingdom with those I love but see no longer: for you are the Resurrection, and the Life, and the Repose of your departed servants, O Christ our God, and unto you I ascribe all glory: to the Father, and to the Son, and to the Holy Spirit; now and ever, and unto ages of ages. Oh Lord Jesus Christ, who said to your apostles, "Peace I leave with you, my peace I give unto you"; I pray that I and your whole church, the body of all faithful people, will know your peace, and live in harmony and unity, one with another, in accordance with your wishes. This I pray to you, who lives and reigns forever. This is my servant, who I support, and my chosen, in whom my soul delights: I have put my Spirit upon him, and he will bring justice to the Gentiles. He will not cry out, nor raise his voice, nor make it heard in the street. He will not break the weakest reed nor quench a dimly burning candle: he will bring justice through truth. He will not fail or be discouraged, until he has set justice on the earth: and the islands will wait for his law to come. "I, Jehovah, have called you in righteousness, and will hold your hand, and will keep you, and make a contract with your people, as a light for the Gentiles; to open blind eyes, to free the prisoners from the dungeon, and those that sit in darkness out of their jail. I am Jehovah, that is my name; I will not give my glory to another, nor praise for my works to graven images. See now, that the former things have happened, and that I tell you what is to come, before it occurs." This section of Isaiah refers to the Messiah. It was Isaiah who primarily predicted the coming of Christ and accurately prophesied many of the main events of his life. Here he emphasizes two aspects of Christ which were not generally accepted as traits of the Savior. First, that he would be peaceful; he would bring justice through truth rather than through force. Second, that he would extend God's covenant to the Gentiles and to "the islands", i.e. throughout the world far from Palestine. God is quoted by name, which was translated into "Jehovah" by early English translators of the Bible. In Hebrew it is four letters (no vowels), which can be transliterated as YHVH or YHUH. The name more frequently written and pronounced "Yahweh" today, but has had many spellings, such as Yehovah, Yehveh, Yeveh, Jhuh, Javah, etc. The Jews never pronounce it, and the true pronunciation is utterly unknown. The quote from Jehovah consists of three of the strongest ideas of both Old and New Testaments. First, the use of light as a metaphor for God's word, with associated metaphors such as allowing the blind to see (as everyone is blind in the dark). Second, the image of humanity in a dungeon until freed by a covenant with God. And third, God's rule that glory for His word and works be ascribed to Him. 1 Corinthians 15:52: For the trumpet will sound, and the dead will be raised imperishable, and we shall be changed.